I know that posts about Essley are few and far between around here, but today I'm going to gush about her for a couple of minutes because (1) I think she's the coolest (I really do) and (2) we were recently introduced to the the cutest collection of baby clothing and toys ever that just happen to perfectly align with her current two very favorite things (mice and ballet; more on that in a minute). She has had so much fun playing with her new goodies that I had to snap some pictures and share. I've also become such a fan of the company who makes these items that there was just no way I couldn't say anything about them. So here we go. Robbie's parents live in Arizona but we FaceTime with them often, and a few weeks ago his mom started regularly reading Essley a story about a mouse from Robbie's childhood. Essley absolutely adores this story - to the point that within seconds of connecting, she starts saying "Mouse! Mouse!" in anticipation of hearing it. And ever since, she instantly gravitates to anything with a mouse. She now has a mouse toothbrush. Her favorite shirt has a mouse on it. To her, mice are the the bee's knees. Essley has also taken a recent fondness to anything having to do with ballet or dance. I mentioned in a post a couple of weeks ago that she starts dance class soon (two weeks from today, actually), and you can't even say the words "dance class" without her instantly busting into her personal collection of killer dance moves. My friend Molly, a dance teacher, sent Essley a pair of tap shoes when I was pregnant with her and they just now fit perfectly, and the kid is obsessed. And if she sees anything with a tutu or ballet slippers, it's like she just spotted a freaking unicorn, man. Needless to say, ballerina is at the very top of our Halloween costume idea list. 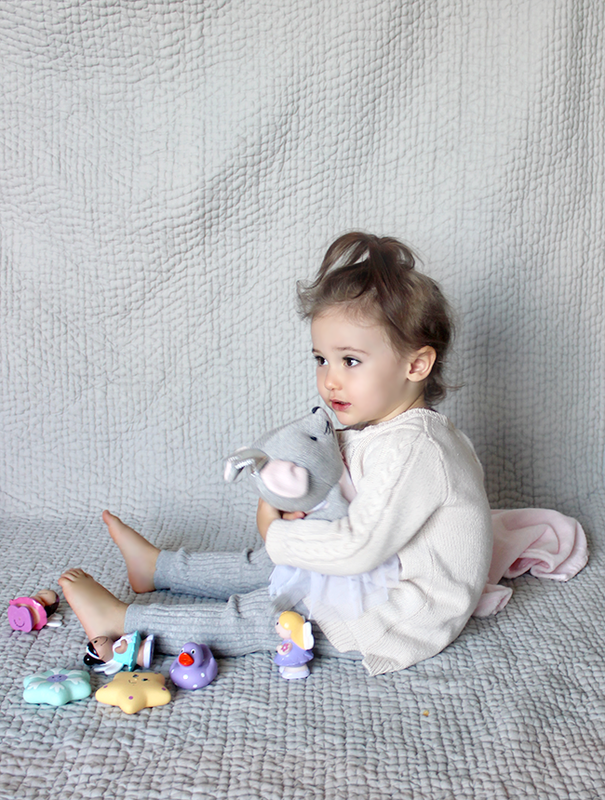 Now that you know these things, it probably makes sense why Essley is so thrilled with the Princess Mousie Collection from Elegant Baby. First of all, the story behind it is absolutely adorable (you can read it, in "chapters," right here on their blog). Secondly, it is basically making all of Essley's toddler dreams come true by combining a mouse with ballet. Her favorite toy right now is this super sweet knit ballerina mouse (which she calls "Mousie"). She carries it everywhere and when she hears music, she makes it dance. It's ridiculously cute. She also has to have her knit ruffle ballerina mouse blanket on her during story time, and she gets so excited to use her special mousie bathwrap after bath time. For those of you with little ones, babies on the way, or with friends or family members who have babies or toddlers, I highly recommend checking out this very special brand. They're currently running a promotion for 10% off your entire purchase on their website with code FALL10 (good through October 16th), so now is the perfect time to pick up a few of their adorable products. For those of you with little ones (or nieces/nephews, or grandkids, or friends with little ones), what are their favorite things right now? Any one else have a kid obsessed with mice and ballet? This post is in collaboration with Elegant Baby. 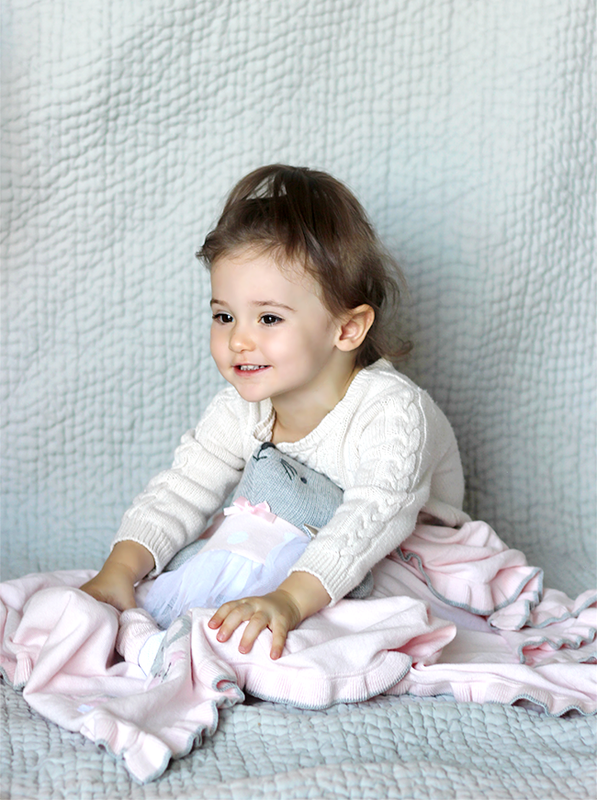 Essley looks absolutely adorable in the photos! Love the flower and lace headband! The ballet mouse soft toy is really cute :) My niece is already ten years old and she's very much into electronic gadgets! She is so beautiful! The toys are all adorable. My niece would love that mouse for Christmas. Essley is adorable! Lovely pictures! The mouse is cute too! Right now my niece and nephews are into dirt bikes...mainly because Uncle Jesse just bought them one last weekend...lol! Thanks for your comments everybody! Seriously, cutest toys ever.